This one is clear. In both my long-time NBA league and the 8 and 9 category format, Durant holds a small, but clear, edge over LeBron James. James may have a ring, but Durant helps a fantasy team more. In cumulative categories they’re closely matched – James gets a lot more assists, a few more rebounds, and maybe more steals, while Durant gets more 3s, blocks, and a few more points. LeBron is great from the floor, at 56.5%, but Durant is now very good, 51.9%. Edge to James. But what puts Durant ahead, and decisively, is his foul shooting. LeBron is a little below average, at 74.3%, but Durant’s 90.7% leads the league for players with at least 100 attempts. But Durant has nearly 500 attempts, second only to James Harden, so his impact in FT% is huge. Indeed if FT% weren’t a category, James would be the fantasy MVP, by a hair in ESRA and 8 cat, and a little more in 9 cat (since he has fewer turnovers). This isn’t a great year for NBA rookies, but Lillard has been the most valuable so far in all three formats. The Blazers’ rookie PG is scoring 18.3 points per game, with 6.45 assists, and 3.25 rebounds. He’s hitting 85.6% from the line, and has made 116 3s on the year. He’s currently the 5th best PG in my 8-cat sample rankings and 9th best in 9-cat. He still turns the ball over a lot, and his shooting from the floor (41.8%) drags offsets good cumulative totals. Harden no longer has to play second-fiddle to Kevin Durant, and his numbers are up across the board, posting career bests in almost every category. His per-game averages are outstanding: 26.1 points, 4.75 rebounds, 5.7 assists, 1.87 steals, and nearly 0.5 blocks. His foul shooting is a career-best 85.5%. The only blemish, and it is minor, is that his field goal percentage is down to 44.8% after being over 49% last year. But his owners will gladly take that trade, as the cumulative improvements more than make up for getting easier shots while teams focused on Durant. Harden’s numbers are eerily similar to Kobe Bryant‘s, but he’s getting a few more steals, blocks, and 3s to make up for Bryant shooting a little better from the floor. And so Harden is worth a little more in all three formats. Since Kevin Durant is clearly the top SF, I’ll talk about Batum, who ranked #3 overall (and #2 among SF) in both my 8 and 9 category rankings. Batum is scoring just 15.4 points per game, but he’s filling the rest of the stat sheet quite well: 5.9 rebounds, 4.9 assists, 1.25 steals, and 1.15 blocks, and he’s hit 120 3s on the year. His shooting is poor from the floor, and quite good from the line, but since he’s not taking nearly as many shots as the big scorers, they have much less impact. Batum’s line is an important reminder that format matters. While he ranked 4th overall in 8/9 cat (and 2nd best SF), he actually drops to 19th in ESRA, where his 3s don’t count at all, and the steals and blocks are worth less. Yes, LeBron is clear top PF by far, and he’s now shooting a career-best 56.5% from the floor, as if his other numbers weren’t impressive enough already. But while he’s nowhere near in LeBron’s class, Blake Griffin is having a big year, shooting 54% from the floor, and is the #2 PF in all formats. Also having a great year is the Big Fundamental Tim Duncan. Greg Popovich may rest him at times, but he’s playing quite well when he does play, shooting 50% from the floor and a career-best 82.4% from the foul line. Add in 2.75 blocks/game and few turnovers, and he’s been especially valuable in 9 cat leagues. No centers are having stellar seasons this year, as Noah’s 10th in ESRA is the highest spot for a center. Noah is filling the rest of the stat sheet – just 11.8 points per game, along with 11.4 rebounds, 4.1 assists, 1.3 steals, and 2.0 blocks. Add in respectable percentages, and you’ve got a good, solid player. 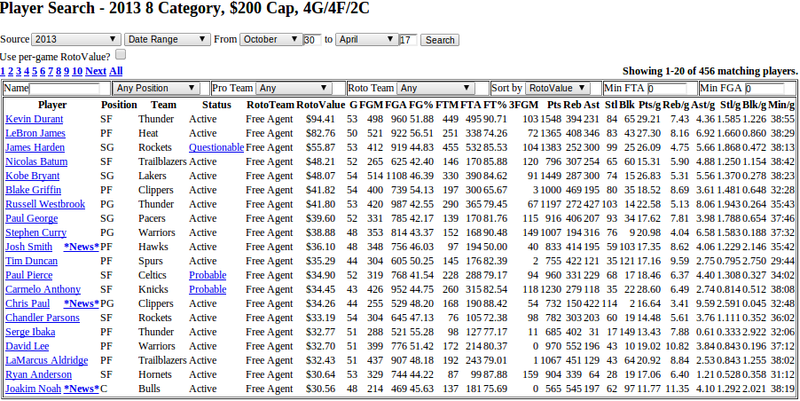 But since centers basically don’t take 3s, their value falls relative to other positions in 8 and 9 category leagues. 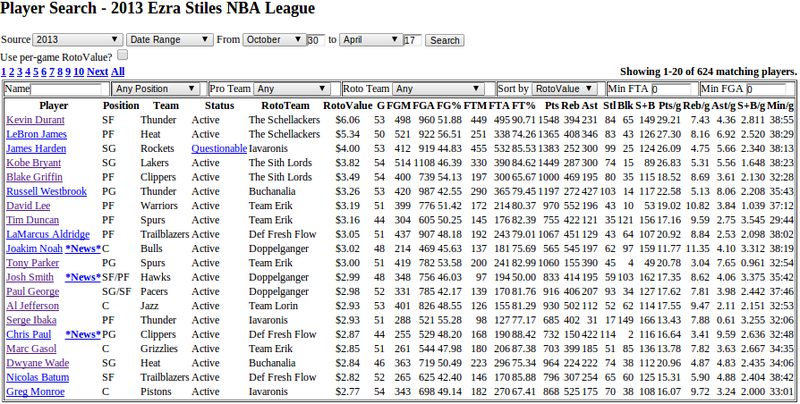 Noah’s value is 20th best in 8 cat, but he still edges out Al Jefferson. Jefferson scores more but does less elsewhere, as better (and more frequent) shooting led to 17.5 points per game, but 9.5 rebounds, 2.1 assists, 1.0 steals and 1.1 blocks. That less also extends to turnovers, where Jefferson has just 64 on the year so far, compared to 136 for Noah. That big gap explains their ranking order switching, and indeed Noah also slips behind Marc Gasol when turnovers are a negative. I’ll conclude by showing the top 20 players in each format – the image links to a dynamic page for the relevant league, while the name link describes in detail the scoring and roster rules for each format. So to summarize, no matter how you play, Kevin Durant and LeBron James are the two most valuable fantasy players this year, with Durant a little better in most formats. But after the elite tier, player rankings become more dependent on the particular categories and roster needs of a league. This entry was posted in NBA Basketball, RotoValue. Bookmark the permalink.